Vietnam Prime Minister Nguyen Xuan Phuc, representing APEC during the Group of 20 leaders’ summit in Hamburg, delivered a strong message of support for international cooperation to address trade and growth challenges in the unsettled global environment. 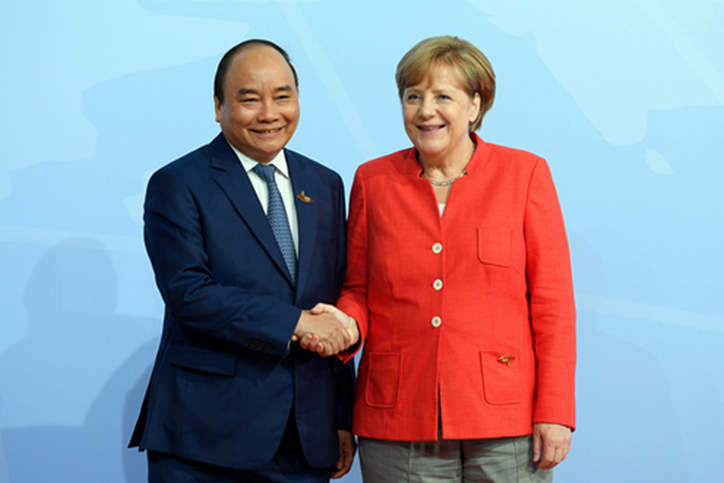 Invited by German Chancellor Angela Merkel to join the summit in Vietnam’s capacity as APEC chair for 2017, Prime Minister Phuc underscored the alignment of APEC and the G20’s policy priorities and vowed to take new and impactful actions to advance them leading up to the APEC Economic Leaders’ Meeting in Da Nang in November. “Creating a new and more powerful momentum for growth from innovation is essential to maintain dynamic development,” declared Prime Minister Phuc, in his remarks to G20 leaders. Prime Minister Phuc noted that APEC economies and G20 countries are both working to realize deeper, next generation economic integration and trade. This includes efforts to promote regional connectivity, limit protectionism and strengthen the global trading system while ensuring that greater benefits reach all corners of society. Recognizing concerns about the unintended consequences of globalization, Prime Minister Phuc explained that APEC economies are actively pursuing measures to foster more inclusive and sustainable trade and growth while helping those displaced by competitive and technological change. This includes APEC initiatives to open up channels that can enable small businesses to modernize and participate in trade and global markets. “Governments need to provide a favorable institutional and financial environment for small and medium enterprises, especially to encourage innovative startups, application of digital business models and participation in global value chains,” Prime Minister Phuc said. APEC is taking parallel steps to enhance employment prospects across workforces as demand for new skills evolves as well as improve labor protections to mitigate the effects of market competition, automation and sectoral change. This includes helping those hurt by job losses and empowering people to take advantage of new opportunities as economies look to the future. Members are also having intensive discussions on inclusive economic, social and financial development, and are working closely in promoting sustainable growth and tackling the impacts of climate change. Nearly half the G20 are also APEC members economies Vietnam joined the G20 members to draft the declaration endorsed at the conclusion of the G20 leaders’ summit. Trade and sectoral officials from all 21 APEC economies, which together account for half of global trade and 60 per cent of world GDP, will convene in Ho Chi Minh City from 18-30 August to press ahead with implementation of the region’s policy priorities. It will be followed by key sectoral ministerial meetings in Vietnam, Korea and Papua New Guinea to build on this progress and culminate with the 2017 APEC Economic Leaders’ Week hosted by Vietnam Prime Minister Phuc from 6-11 November in Da Nang to provide directives on moving forward.